No machine on Earth demonstrates time quite like the tourbillon. Indeed it could be the most sophisticated physical depiction of an abstract notion ever developed by man. This hypnotic, rotating and oscillating mechanical world reveals multiple facets of time: its unfailing regularity, its intricacy, its inevitability and a culture of time measurement as old as humanity. In its Histoire de Tourbillon collection, Harry Winston recognizes the tourbillon as a medium of artistic expression unique in scope, depth and subject — a work of art that shows you not only the time, but the nature of time itself. Mathematicians, engineers, craftsmen, philosophers and designers combine to challenge the laws of physics by creating a mechanical dance that unveils time’s tantalizing secrets. The third series in Harry Winston’s exploration of the tourbillon choreographs two rotating escapements that guide the time unscathed through the pitfalls of gravity. Three tourbillons are in action, each rotating at different speeds to perform distinct gravity-defying functions. Two of them are nested one inside the other to rotate the fourth dimension of time through the three dimensions of space. In this bi-axial tourbillon, one tourbillon carriage rotates every 40 seconds within a second carriage going around in 120 seconds on an axis perpendicular to the first. This ensures that the vibrating balance moves through every possible plane in relation to the field of gravity to average out positional errors. 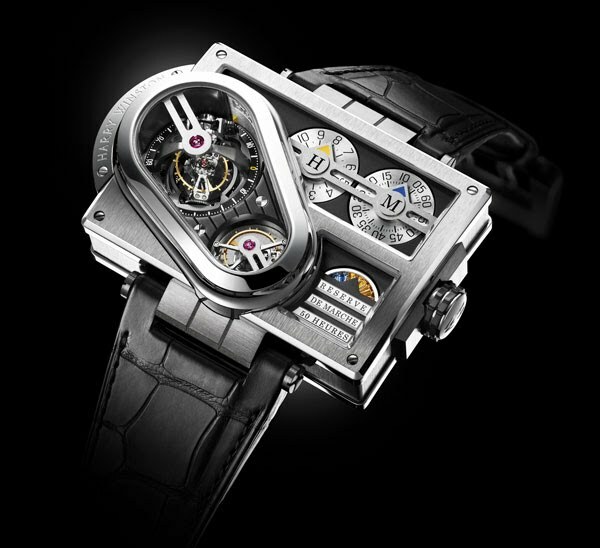 The third tourbillon carriage rotates a separate balance on a single axis in the conventional way, but at the relatively high speed of one revolution every 36 seconds. This tourbillon is most effective when the watch is in a vertical position, and by rotating the balance quickly it minimizes its exposure to the effects of gravity. For even greater precision, the two regulating systems are connected through a differential gear that gives an average of their two rates. Uniting three tourbillions and two escapements with different properties in terms of mass, rotational velocity and inertia proved to be a delicate exercise in the balance of power. For example, the double tourbillon system has to be made as light as possible using titanium and aluminum alloys so that it does not consume a disproportionate amount of power at the expense of the single tourbillon. The watchcase, engineered to display the tourbillon systems to their best advantage, is unlike any other. The complex architecture is constructed of 77 parts in white gold and non-reflecting sapphire crystals with the caseband and lugs in Zalium®, a hard and ultra-light zirconium alloy. Developed for use in jet engines, its non-allergenic properties and extreme resistance to corrosion make it ideal for watchcases. The fluid outlines of the tourbillon housing in polished white gold contrast sharply with the rectangular rigidity of the lower case displaying the indications. Even the Harry Winston triple-arch motifs on the lugs have been squared off. Lustrous finishes — surfaces brushed to a silky texture, gleaming chamfers and the matt battleship grey of the Zalium® — set off the bold outlines of this extraordinary architecture. The hours and minutes are shown on discs rotating against their respective markers, and the seconds on a scale around the bi-axial tourbillon. Harry Winston shows off its flair with gemstones by using sapphires and citrines to indicate the power reserve. Eleven color-graded blue sapphires from dark to pale show the power left in the mainspring. The markers for the hours and minutes are color-matched with the gemstones. When the six yellow citrines appear against the marker, it’s time to wind up the watch. Only 20 of each tourbillon artwork in the Histoire de Tourbillon collection are produced. Each model takes the evolution of this fascinating machine a step further to reveal more of the secret workings of time.